Liz and I met at the Festival of Faith and Writing, in line to speak with Anne Lamott. We quickly discovered that we went to the same college, and that our similarities in journey do not stop there. Since then, I have enjoyed getting to know Liz and her writing, and I'm delighted to share her de(tale) with you. Enjoy, friends. I would never choose weird, iridescent purple wallpaper for the lower half the walls, bordered by a wooden chair rail. I wouldn't pair that wallpaper with an equally ugly purple border along the top of the walls. I wouldn't have a tiny floral-print valance at the top of my kitchen window. I would not put a Formica tabletop on cherry legs. I would not own wooden chairs with hearts in the back of them. Stripping wallpaper takes work, though, and I could never get rid of my kitchen table. My Grandma Millie designed and ordered it in the 1950s when she inherited money from her beloved aunt and uncle. My mom, my aunts and uncles, my cousins, my siblings, and I all grew up around that table. I even have the original receipt for the table and chairs. I've lived here for two years. Those little things should probably be thrown away, but then again, they've lived here for a lot longer than I have. As far as I know, Grandma Millie put them there before she died a decade before my grandfather. What right do I have to pitch them? Before my family and I moved in, this was my grandparents' house. When we emptied it of their things, we had to decide what should be done with every single item. In some ways, the kitchen was the easiest room of the house. There were things that everyone knew should go to family: treasured glasses, a spice rack, the cast iron skillets. There was obvious trash: food that had been in the freezer for years, cracked Tupperware, skillets with the Teflon scraping off. And there were plenty of things that no one had sentimental attachment to and could go to auction: pots and pans that Grandma's hands had never touched, placemats that had never been set at the Thanksgiving table, tablecloths that no one had ever seen before. Circumstance determined that I was the grandchild who organized much of the move-out. As easy as the kitchen was, I managed to miss the windowsill. I simply overlooked it. Didn't touch the silly Garfield figurine. Didn't touch the potted geranium bloom. Sometimes, I imagine what my grandmother would say if she came home again. She died in a hospital bed in the living room more than a decade ago, surrounded by family, and so much has changed. She would not think the house was clean enough, I know that. She would shake her head at the pathetic nature of the front flowerbeds. She would look at the living room and say, "We should hem those curtains a little shorter." Why do you keep the mixer on the garage shelves? You don't have a flour sifter? What do you mean, you've never baked a pie? Elizabeth, you're thirty-one years old. It's time to graduate from brownies to real baking. Perhaps she wouldn't be happy about the way I take care of the house, but she would be happy that there are children here. This home is filled with toys and art and picture books. She would like the guinea pigs. She would love the little dog; she always loved little dogs. When I wash dishes, I stare out the window in the woods of the backyard that she looked out of. Perhaps the deer I see are the descendants of the ones she used to put out salt for. I use her refrigerator. I use her Correlle dishes. Months before she died, I was with her in the living room. She had been reading to me some poems that she had written over the years. I was eighteen. I was bored. I was selfish. I wanted to go home and watch a show that was airing in fifteen minutes. I didn't know how little time we had left. I kissed her good-bye and left for home. Later, I learned that she cried when I left. She had wanted me to stay longer. I should have listened to more of her poems. I should have sat with her. I wasted so much time that I could have spent with her. Isn't that what we all say when we lose them? What did I throw away without even realizing it? My grandmother will never walk through the front door again. I know this. She cannot see the house, or the neglected flowerbeds, or the front room that we just painted yellow, or the lovely new bathroom. She does not know my husband, my children, my pets. She does not know that I have moved into her house and am trying to honor her memory in the way that I live. I threw away so much. 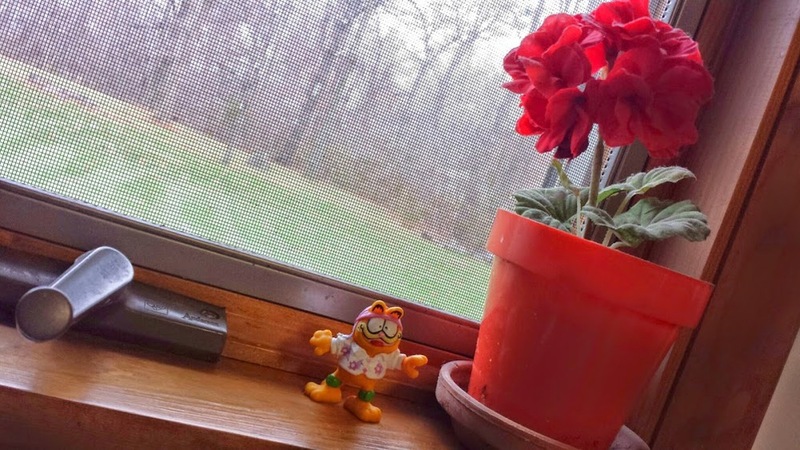 I cannot throw away that Garfield in the window. I can't throw away that geranium. Look, Grandma, I'll say when she walks in the door, I saved these things. Can you tell me why you put them here? Liz Boltz Ranfeld is a writer and college English teacher from Indiana. She blogs about living and parenting as a liberal feminist Christian at www.lizboltzranfeld.com. You can also find her on Twitter and Facebook. She has written for Persephone Magazine, Faculty Focus, the Shriver Report, Role Reboot, Everyday Feminism, and Jezebel.